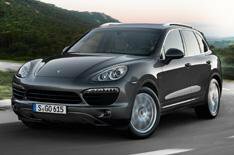 2013 Porsche Cayenne S Diesel revealed | What Car? This is the new Porsche Cayenne S Diesel, a V8-powered diesel model that will make its debut at the Paris motor show later this month. The Cayenne S Diesel has a 377bhp 4.2-litre twin-turbo V8, and will sit above the current 242bhp V6 diesel model. Its 627lb ft of torque is the most pulling power of any Cayenne. The 0-62mph time of 5.7 seconds is two seconds quicker than the V6 diesel's. Top speed is 157mph. Average fuel economy is 34mpg, while the CO2 emissions figure is 218g/km. Porsche claims the S Diesel has a range of 745 miles per tank. Standard equipment includes leather upholstery, dual-zone climate control, front and rear parking sensors, eight-way powered front seats and 18-inch alloy wheels. The Cayenne S Diesel will hit showrooms in January, and costs from 58,243.